The D12S400 5.0~13.2V wide input, single output, non-isolated point of load DC/DC converter is the latest offering from a world leader in power systems technology and manufacturing -- Delta Electronics, Inc. The D12S400 and ND/NE product families are part of the second generation, non-isolated point-of-load DC/DC Power Modules which cut the module size by almost 50% in most of the cases compared to the first generation NC series POL modules for networking and data Communication applications. D12S400 product provides up to 80A in the same form factor of the second generation 60A datacom POLs and the output CAN be resistor trimmed from 0.8375Vdc to 5.0Vdc. 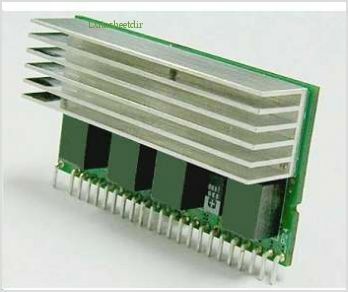 It provides a highly efficient, high power and current density and very cost effective point of load solution. With creative design technology and optimization of component placement, these converters possess outstanding electrical and thermal performance, as well as extremely high reliability under highly stressful operating conditions. By Delta Electronics, Inc. This is one package pinout of D12S400,If you need more pinouts please download D12S400's pdf datasheet. D12S400 circuits will be updated soon..., now you can download the pdf datasheet to check the circuits!